The vast range of TRS pre-packed foods include Whole & Ground Spices, Almonds, Cashews, Roasted Pistachios, Green Raisins, Sugar Candy, Roasted Chick peas, Dried Dates & Dried Apricots. Do not consume uncooked. It is a cooking ingredient. 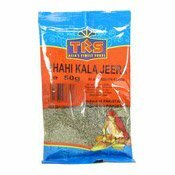 Ingredients: Black Cumin Seed (Kala Jeera).